These activities include sweeping, pouring, polishing, care of one´s self, food preparation and dish washing, as well as basic exercises of grace and courtesy. Through these exercises, a child learns to work on real life tasks that foster independence, coordination, order, concentration, and the persistence to complete a cycle of work. Children enjoy choosing and performing these new and exciting activities, lengthening their attention span and developing concentration as they work with them repeatedly. The exercises also help teach skills involved with caring for the environment and the self, and helps promote high self-esteem. Helps children to order, compare and classify sensory stimulation. It allows for their intellectual development to be greatly assisted and for future learning to be more meaningful and useful. Sensorial activities helps children build cognitive skills and by teaching how to order and classify impressions by touch, sight, smell, taste, sound, and exploring the physical properties of the environment. 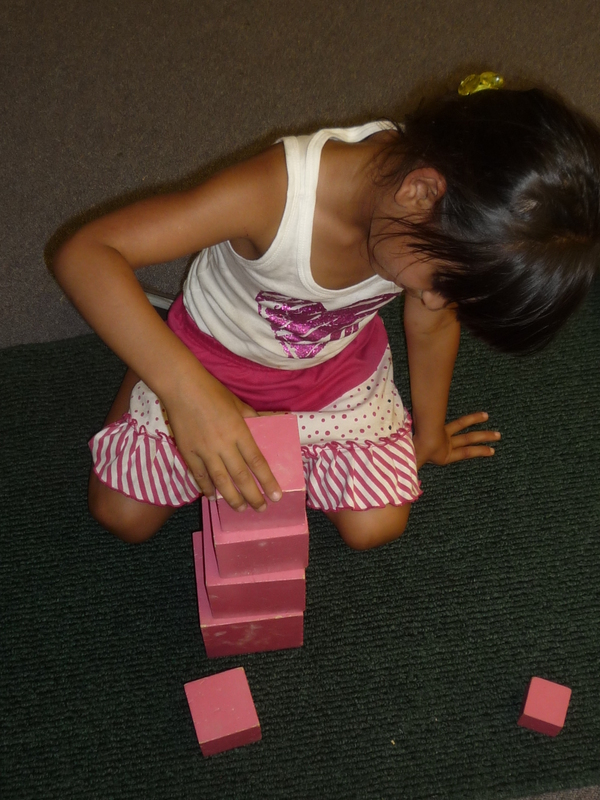 The Montessori materials utilized include pink towers, geometric solids, color boxes, and more. 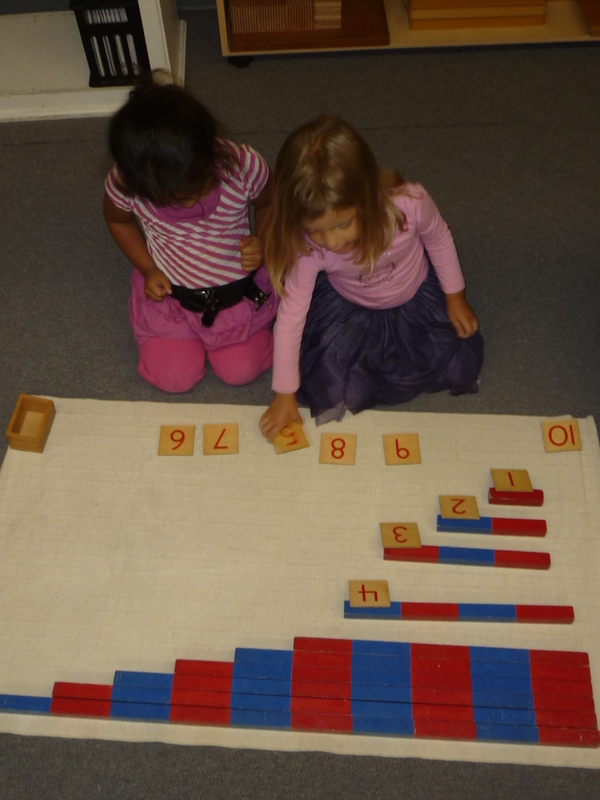 The language part of the Montessori curriculum explores both written and verbal lang uage. The written language is taught through writing. 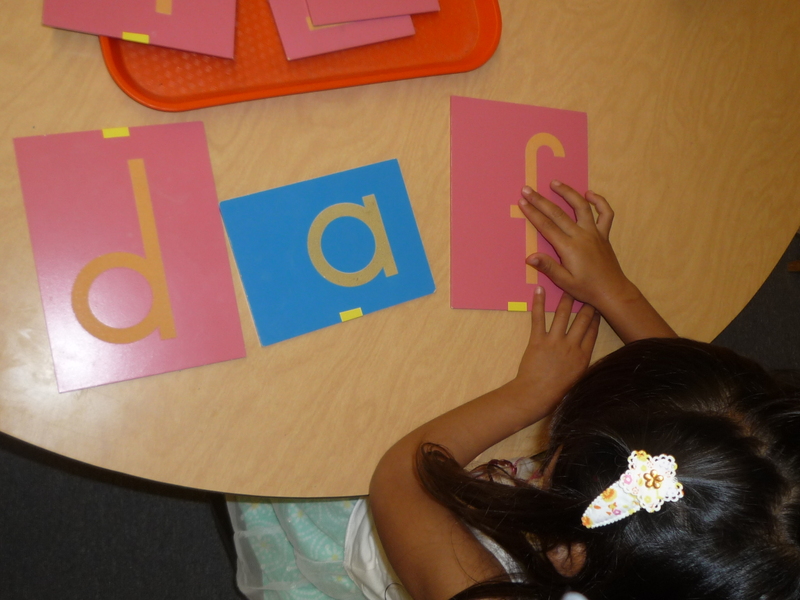 Tactile sandpaper letters introduce the children to letter shapes and phonics, and lead them naturally to read and spell. In the Montessori Method, writing precedes reading, as the children explore with drawing and forming letters. They are prepared for reading indirectly through writing. Dr. Montessori’s research showed that children learn best by touch and manipulation, which is exactly how the Montessori materials teach them how to write and read. Children are able to practice and explore oral language through conversation, stories, and poetry. The central purpose of the Math materials is to lay the foundation for later cognitive development and to prepare for the gradual transition to abstract thinking. Concrete mathematical concepts are introduced with a variety of materials that enable the child to understand numbers, quantities, and symbols. 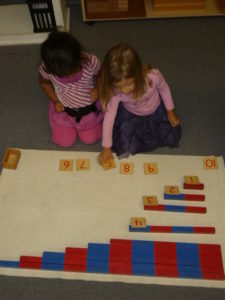 Montessori students use hands-on learning materials that make abstract concepts clear and concrete. The Montessori materials utilized include number rods, sandpaper numbers, spindle boxes, cards and counters, and sequin boards. 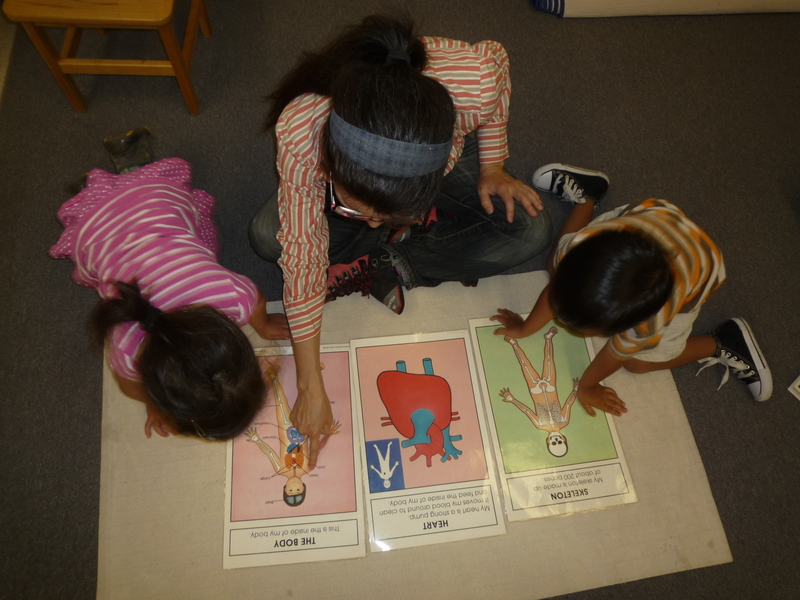 Montessori offers an array of activities in sciences, history, geography and the learning of Spanish. The curriculum helps children develop a lifelong interest in observing nature and discovering more about the world in which we live. They learn how to read maps and begin to learn the names of the world’s continents and countries. The art activities offer children ways to express themselves, their feelings, experiences and ideas. Children learn most rapidly when they are young. 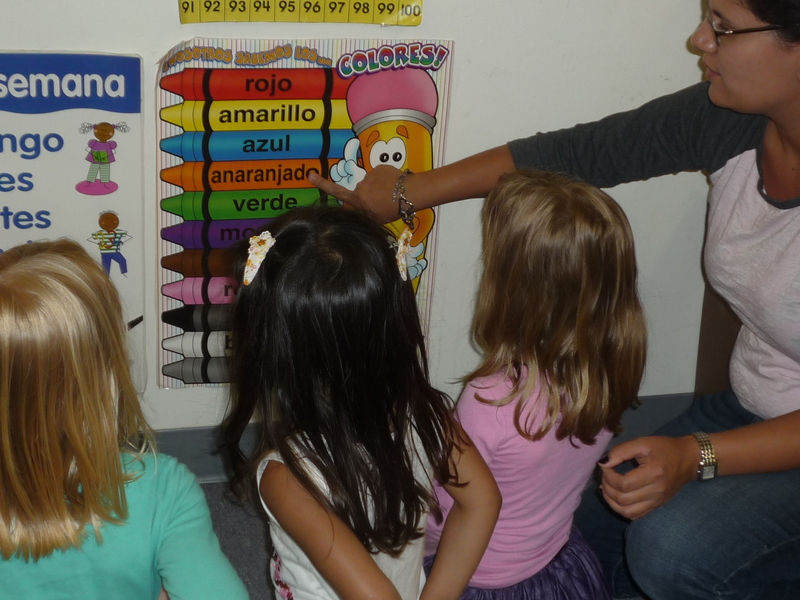 As such, Bright Montessori has incorporated a Spanish class into its curriculum.